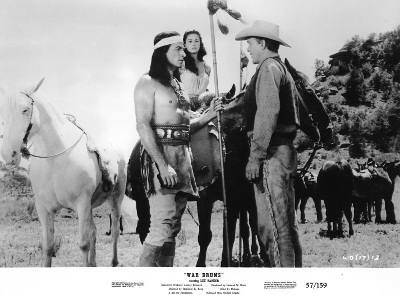 "90 Years of Lex Barker"
Lex Barker, who would be 90 years old on 8th May 2009, still has his place in the film history as Tarzan and Old Shatterhand; many fondly remember the simpatico US American. Friends and colleagues look back at Lex Barker, who always remained humble, despite his popularity, with great affection. "He never mentioned anything to me about his status, but that's typical because he never boasted or put himself at the center of attention," his earlier film partner Mara Corday confirmed. "I was very surprised when I learned that Lex was a big star in Europe!" On the occasion of his 90th birthday, several television stations remind their viewers of the anniversary, whereby we point to especially the movie bundles aired by MDR (Mitteldeutscher Rundfunk) Television during Premiere Nostalgie in Germany. A new application for a star on the Walk of Fame in Hollywood is in preparation and, in addition, there is more activity in connection with the filming of the documentary on Lex Barker's life. Shortly, there will also be a new edition of the actor's biography. 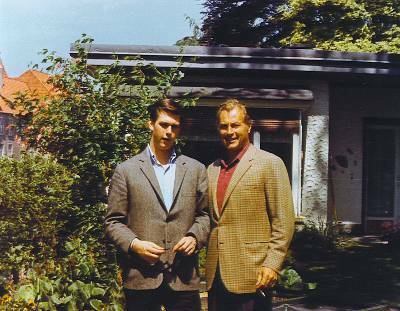 On the occasion of Lex Barker's 'big 90', sons Zan and Christopher remember their father. 1. May 8, 2009 would be your father's 90th birthday. He is unforgettable especially in his parts as Tarzan and Old Shatterhand. What comes to mind when you think about his fame (around the world)? 2. What is your favourite movie where your father starred or your favourite part he played? 3. When you look back — do you have a special memory about your father that comes to mind spontaneously? 1. Dad seems to have celebrated life more than others. He celebrated the positive qualities and kinder aspects of people. Some said he was from a different time; people still remember the finer things he accomplished: his fifty films, his children, that he spoke five languages, knew how to sail a boat, how to ride a horse, to hunt, deep sea fish, scuba dive, snow ski and fence. He did many of his own stunts — and was a powerful and beautiful swimmer. He loved his seventy-five foot yacht, Peter Pan with Tinkerbell as the runabout. He was a gentleman in the truest sense... and they say he wasn't bad looking, either. He had a kind word for everyone he met, but stay clear of him if the volcano was about to go off. He gave me the advice that it was better, although more difficult, to walk away from a fight...and always try to turn the other cheek. 2. It always amazes me that he made such an impact in his role of Tarzan, and that people primarily remember him for portraying the jungle hero. 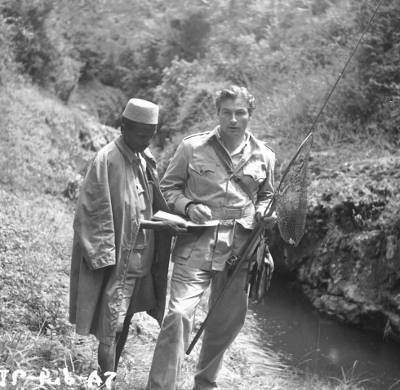 I've met countless people whose lives were improved because of him, for example, there is a gentleman who lived in South Africa and who as a boy played in the jungle with friends, was even swinging from vines. He was in great shape and still followed dad's instructions on isometrics to this day — employing isometrics in the early films of the fifties. These were exotic for their days. I think one of my favorite films starring my father is War Drums with Ben Johnson and Joan Taylor. Great riding scenes and plot. 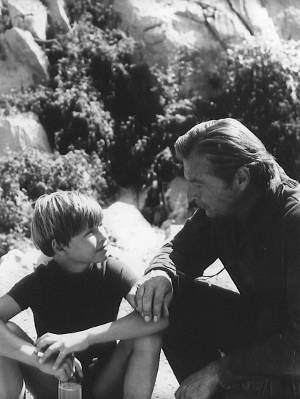 Woman Times Seven showed us his softer side; the Winnetou films were a phenomenal success... but there are always the Tarzan movies. As politically incorrect and corny as they are today, these were the films that took the fans away from their daily grind. He started with summer stock stage plays in 1937, became the youngest captain in WWII, about which he did not like to talk, found success in B movies and European success with the Winnetou westerns, based on Karl May's novels, together with Horst Wendtland and Atze Brauner. That success permitted me to study hotel management at the Berlin Hilton for five years... and then I grew up in the Vietnam war. 3. 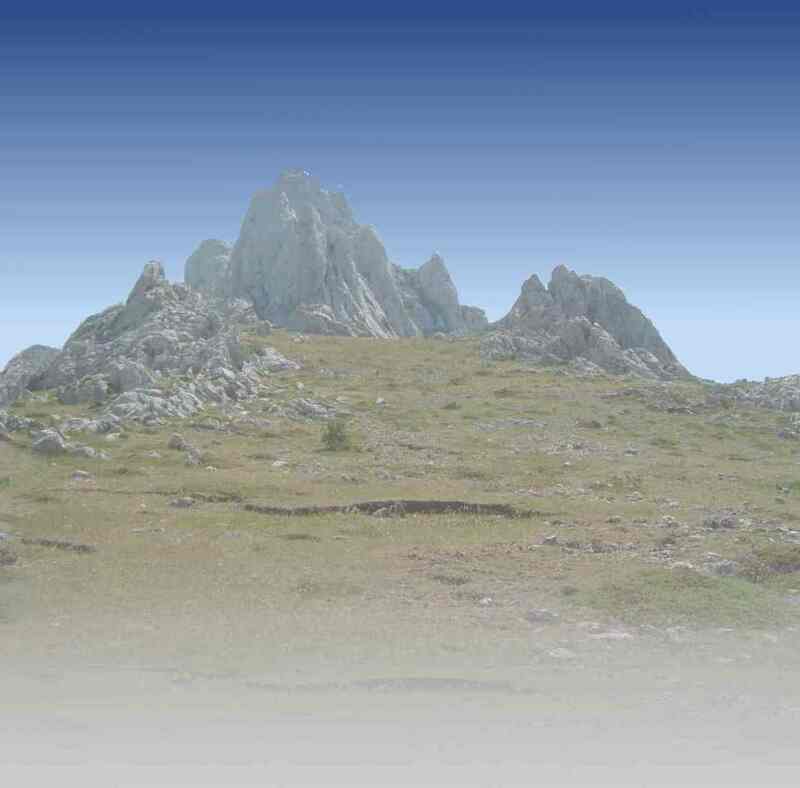 I have a clear memory of being on location in Yugoslavia in 1963, and of a shoot on the high altitude plains of the Rijeka mountains. The scene about to be filmed was that of a huge land rush with settlers in wagons all lined up across the plain... hundreds of riders, horses and wagons of every kind were waiting for the signal that sounded the start of the race to a land claim. Dad did a stunt where he had to jump from the covered wagon to the six horse team, and then climb the yoke to the lead horse on the left. After unhitching it, he rode the racing, galloping horse, which was going full bore, with all of everything like a Cecil B. DeMille's land rush. Suddenly, he kneed and reigned left, with the horse reacting perfectly to commands that were not known to my father as the rider. The horse fell to its left side on cue and it looked as if it tumbled all over Dad, resulting in dust clouds rising hundreds of feet in the air. Some of the wagons and riders continued on in disarray into the distance while everyone nearby or behind the camera rushed to my fathers aid. Most men would be a little shaken. I suppose he was, too, somewhere deep inside, but he didn't let on and the filming continued. I think shooting was reduced that day and we took a few days off from filming. When I asked him what happened, he told me the horse had been trained to fall when directed by the rider's knee pressing hard into its flank. To me, as well as many others, he was just a bit larger than life — like his movies. He lived life to the fullest. I also recall becoming proficient at crawling into the scene on the set of one big sound stage dance production where there was dancing at an African native village... until I was banned from the set, so that they could continue filming without having a little white kid jump into the scene and proceed to shimmy with the natives. 1. I am glad to see that my father is still present on the screen and that he is well remembered by a lot of people all over the world. He left the legacy of a great body of memorable work, but mainly the image of a kind and gentle hero, defending right against wrong — a symbol of an era where these notions were still clearly defined. I miss him personally and because of what he meant for so many people! Happy Birthday Dad!!! Much Love from your children and grandchildren. 2. I like watching my father on the screen and, of course, I have a few favourite parts that he played. Among those are the part of Chief Mangas Coloradas, Tarzan, or Old Shatterhand, maybe because they represent the ideal of tolerance and freedom among the people of our world. Also, his part as the writer in Woman Times Seven, as it fits his personality in real life! 3. I have fond memories of my father (I prefer to let the sad ones slip away). I remember his amazement at the feat of having landed men on the moon and that he said, somehow he would never look at it the same way again; or his kind and warm look full of love when I was sick on his yacht. Also, his look of pride at teaching me how to dive with a spear to catch fish (...and his subsequent disappointment that the fish I caught was so small!). I can almost relive those moments as if they happened yesterday! Time stands still and my father is very much a part of me now... I will always treasure those memories.